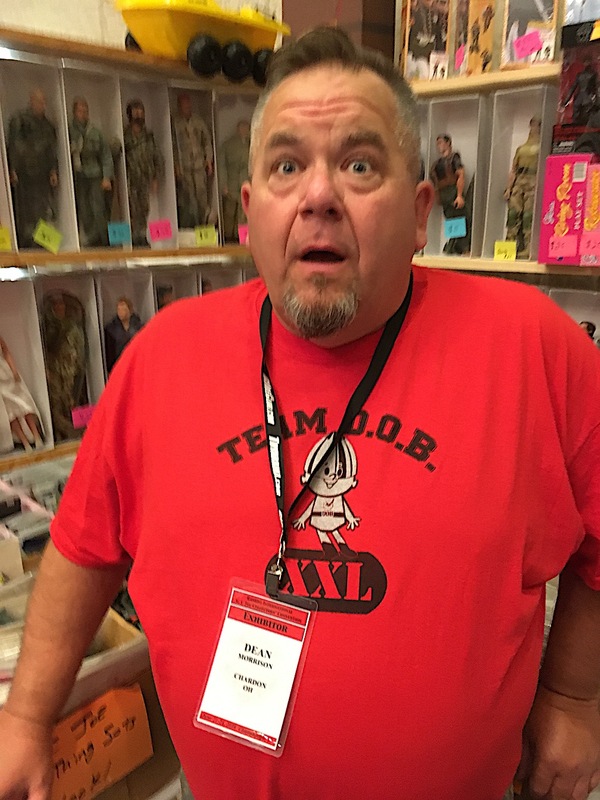 Shock ‘n Aw-Ful— Longtime GIjOE fan, collector and dealer, Dean Morrison, reacts when told that this year’s JoeCon will be the LAST one EVER on the planet Earth. (Photo: Mark Otnes) Click to enlarge. As JoeCons go, this was a pretty good one. Everyone understood that it was to be the last, and therefore attendance was strong and fan spirits were high. Longtime friends gathered again, some for the last time, while new friends were easily made and mutual memories shared. Despite the loss of future JoeCons, “America’s Moveable Fighting Man”—or “Real American Hero” (depending on your age)—has clearly made a lasting impact upon a great number of people and they wanted to say a final THANK YOU to Hasbro, Fun Publications, Brian Savage and the GIjOE Collector’s Club. Holy Halls of Fandom!— The cathedralesque main hall of the Chattanooga Convention Center was perfectly-sized for the BIG events of JoeCon 2018. 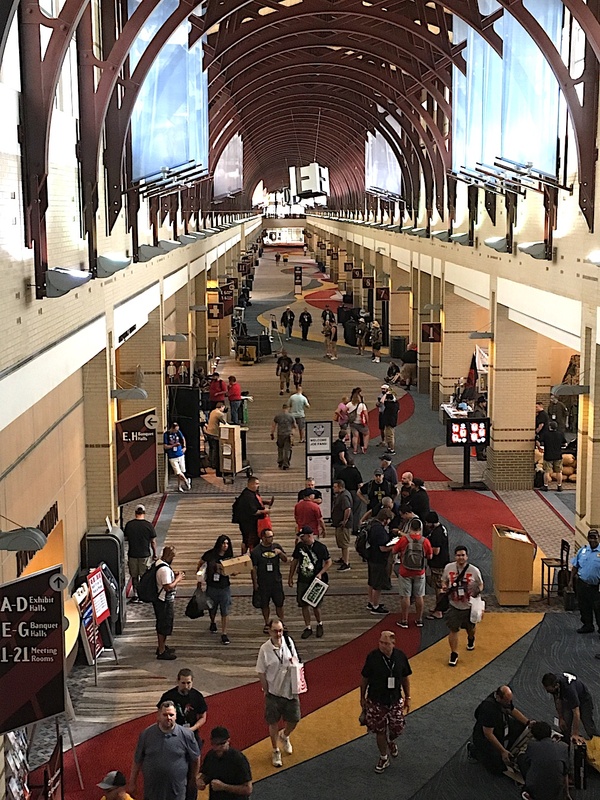 Here, fans are shown milling about, taking acquisitions up to their rooms, visiting the dealer room, touring the diorama exhibits, stopping off at the snack tables, snapping photos in front of cosplay backdrops or walking towards the panel discussion rooms. They were busy, busy, BUSY! Can you find yourself? Or Waldo? (Photo: Mark Otnes) Click to enlarge. “Yeah, I’m a little sad. I’ll miss the people I see each year. It’s been 21 years that I’ve been doing the JoeCons, and it’s bittersweet that this is going to be the last one. “I have mixed emotions about all this. I’m really sad. I can’t believe this is the last one. This is something I’ve been doing on and off since 1994. My friend Burt Montague and I have been playing with Joes since we were 4 years old, so this is REALLY disappointing. There’s no ‘somewhat’ about it. But I understand—I understand where Brian’s at personally. He’s not old enough to retire, but I understand that there also comes a time in life when you can’t keep doing everything, you know? And Brian’s done these shows since 1997, I believe. That’s a long time. Burt and I went to the first one in 1994, that was pretty fun. And boy, how they’ve changed over the years—they really have changed. It’s certainly a 3.75″ focused show now, but there’s still 12-inch guys that love it and there’s always new guys getting in. It’s fun to see the excitement on kids faces, too. I don’t think the hobby’s dead. I think the hobby’s just starting. I think that we’re going to get into a ‘golden age’ of vintage GIjOE. I think for the next 20 years it’s going to be awesome. What’s happening is you’ve got guys whose kids are going off to college and they’ve got grandkids and they’ve got a lot of spare time. They’ve got a lot of boxed Joe stuff in their basement that they’re going to start going through and playing with again. I’m not kidding you. I’ve noticed a trend in the last 2 or 3 years that there were more guys starting to get into it (the GIjOE hobby) again. I think that there is a GREAT future for 12-inch GIjOE. I think that—as always—there are people trying to get in—and out—of their collections. What’s interesting to me is that the ‘common’ stuff is still common, but the ‘rare’ stuff STILL tends to drive a really high price. Watch ebay. See what tends to go for crazy money. It tends to be the harder-to-find. And rare—is still rare. As for my own future, I’m looking at the next stage of my life as more of a GIjOE-focused time. I think there is still a market out there for toy shows. I think Joelanta is an amazing experience. I’m still maintaining my own collection. My collection is not going anywhere. I’m actively buying and selling. I feel that there’s still a very positive market in the collector marketplace and I am excited about the future. I think that we’ve got a bunch of guys that are going to be retiring and they’ll have a lot of free time and this what they’ll do. You know, someone put this out there—the great thing about GIjOE collecting is that it brings you back to when you were 9 years-old and the happiest time in your life. And when you’re 70 years-old, what are you going to do? You’re going to go back to the happiest time in your life and that’s when you were playing with your GIjOEs. “It’s been great. It’s been fun. It’s been packed. I’ve been talking toys all weekend, as I have for almost the last 20 years, and it’s starting to set in that THIS—is IT. But I try to look on the bright side. I’m very depressed. It’ll be a long drive back to Texas because this is it and there’ll never be another Con like this—EVER. People may have had problems with Brian and Fun Pub, but I’ve never had ANY issues with them because they’ve brought so much enjoyment and collectibles to the hobby. The way most conventions go now, they’re such ‘money grabs.’ You’re paying $300 for celebrity autographs. You’re paying $100 to get in. THIS show, buying the boxed set, which no other con is going to have, you get the dinner, the casino, the panels, everything that they pack in. I’ve heard people complain about the price, but you get EXCLUSIVE figures you can’t get ANYWHERE else, plus access to everything at the Con. And they move it around. What other Con is going to tour the country and actually make it viable to do things other than the Con? They had the tours—I personally never did the tours—but I loved that they offered them. You know? And for families it’s perfect. My wife and I did our own tours. We still went to Ruby Falls, yesterday. At Disneyworld, we went to Universal Studios. Together for the last time? 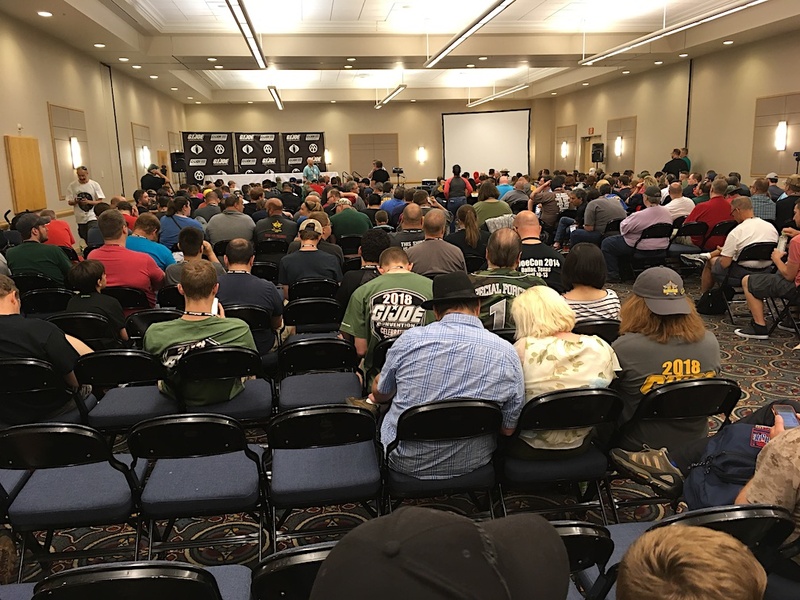 A somber crowd attended what was the last-ever panel discussion—at the last-ever JoeCon— June 24th, 2018, in Chattanooga, TN. (Photo: Mark Otnes) Click to enlarge. “If you’ve ever had any fun in the last 20 some years or so of doing this—it’s all my fault. We’re really gonna miss all you guys, because again without you, there is no GIjOE. It’s truly amazing what y’all do with this. We have to thank God for what he’s given to us. There’s a saying, ‘Do what you love and the money will follow.’ Here you go. And Todd mentioned this awhile ago, ‘We came for the toys and we stayed for the friends.’ So it’s as if we all collect the friends. It’s not the plastic out there. It really is all of you guys (gesturing to crowd). Goodbye Joe Fans— After the show had ended and the fans had departed, we snapped this one final photograph from the 16th floor of the adjacent Marriot hotel. 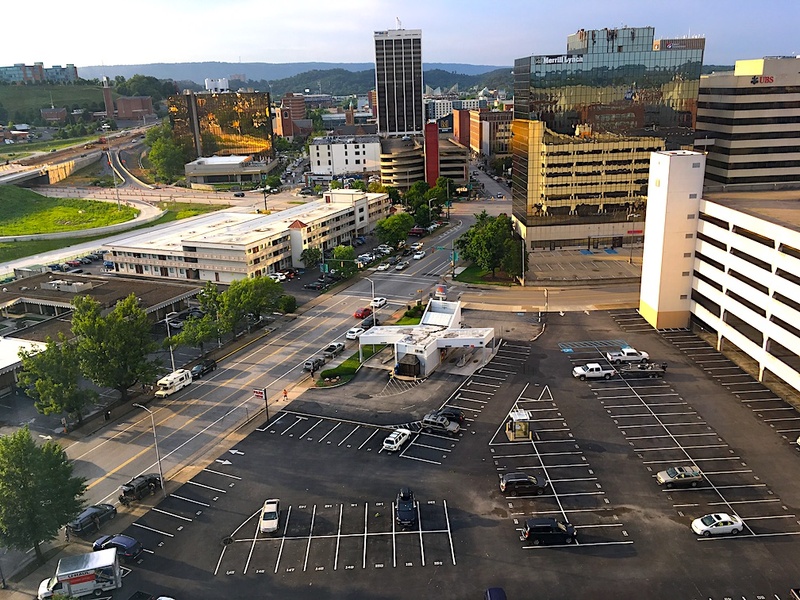 Without the hustle and bustle of JoeCon, downtown Chattanooga became quiet and still. The parking lots—previously packed with visitor’s vehicles packed with GIjOEs and other toys—were now empty. (Photo: Mark Otnes) Click to enlarge. Bottom Line: This was one for the history books—but now that page has been turned. On June 20-24, 2018, the last, official “JoeCon” convention was held, hosted and summarily ended by the (also soon-to-be-defunct) GIjOE Collector’s Club within the vast (yet welcoming) halls of the Chattanooga Convention Center in Chattanooga, TN. As it was before the club’s existence, and as it will be after the club’s demise, GIjOE fans once again find themselves—on their own. If you want to gather fans together for a GIjOE club meeting or host a Joe-related show or event, you’re more than welcome to do so. But from this point on, it can only be done without an official endorsement from Hasbro. Our sincerest thanks to all of the participants who made the content of this article possible and our best and sincerest wishes to Brian Savage and his talented, hardworking crew at Fun Publications for all of the pleasure they’ve given—to so many—for so long. Go (and Yo), JOE! FIRST Look at the Club’s “LAST” 12-Inch Set?— This image is the first pic released by the GIjOE Collector’s Club that reveals (some) of the artwork that will adorn the boxes of their upcoming 2-figure 12″ exclusive set created for attendees of JoeCon 2018. As usual, this military masterpiece comes to fans hot off the easel of “Classic Collection” maestro, Larry Selman. (Click to enlarge). Lay Down Suppressing Fire!— This first pic from the cover of the March 2018 issue of the GIjOE Collector’s Club “Official Magazine” is one we’ve been waiting for for a lonnnng time. 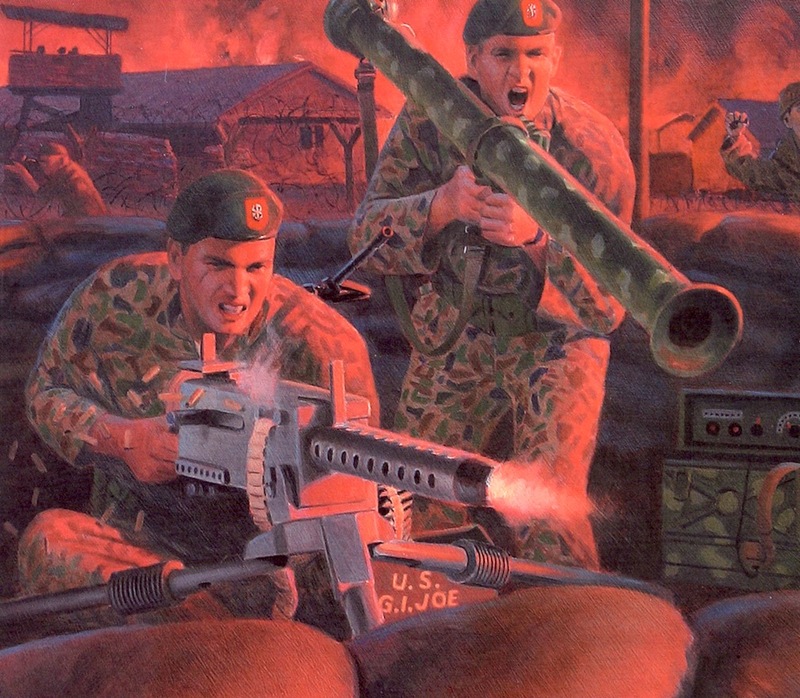 It’s Larry Selman’s latest (and perhaps FINAL) painting for a GIjOE product, the cover art for the “Green Beret Machine Gun Outpost” 12″ figure set to be released this coming June at JoeCon 2018 in Chattanooga, TN. As we expected, the artwork ROCKS and the two Special Forces soldiers shown are clearly “in it” and fighting for their lives defending their sandbag-ringed outpost. If you look carefully, you’ll get a pretty good idea of all the equipment that will included in this set. HOO-ah! Completely Black-n-White (Almost)— Is it really, physically possible to create ALL of these figures and ALL of their equipment SOLELY in black and white shades and hues? The ad copy above states this is a “color image,” and we do indeed seem to detect a faint tinge of green in the skin-tone of a couple of the figures. The copy also states that these are “preproduction figures,” so let’s hope this issue is corrected before the final figures are made. We wouldn’t want our action soldiers and marines to look queasy, now would we? (Unless they “glow-in-the-dark!”) (Photo: GIJCC) Click to enlarge. Bottom Line: If this really is the final year (and final convention) for the GIJCC, then it appears they intend to go out BIG TIME with some truly collectible products. Hopefully, any color or tonal imperfections in the plastics and other materials can be worked out before the “B&W TV Editions” are released. We can’t wait to see more pics of the Green Beret set’s box and contents, either. We’re sure it’ll all look AMAZING. Stay tuned for additional intel as it becomes available. A Victim of Their Own Success? Word of mouth among GIjOE fandom alluding to the fact that this year’s JoeCon in Chattanooga, TN could very well be the LAST such “national” club convention has many fans (members and non-members alike) scrambling for nearby (affordable) hotel rooms and a chance to purchase (again, what may be) one of the LAST exclusive figure sets ever produced by the GIjOE Collector’s Club. “The 2018 GIjOECon Convention 3 3/4″ sets are SOLD OUT! Currently, we BELIEVE that we will be able to increase the production run for both 3 3/4” boxed and loose sets (attending and non-attending). HOWEVER, our contacts in China have now shut down for Chinese New Year. We have requested that they increase our production run (which won’t happen for another couple of months). It will take a few weeks until we have confirmation back from them concerning our request. Chinese New Year runs through the first week in March. Each factory has a different schedule as to when they return to work. In the meantime, if you are interested in an 3 3/4″ attending, non-attending or a loose set, please let us know by putting yourself on the wait list by sending an email to: Waitlist@funpubinc.com. Please DO NOT CALL about the list. We will notify you about processing your request when the additional quantities are available. You will receive a confirmation email that you are on the list. If you have already contacted us and were told that we have placed you on the waitlist, you do not need to email us. Please don’t get on the list 2x. The list will be worked in the order it was received. Please place in the title of the email one of the following: American Hero waitlist, Homefront Hero waitlist, Attending loose set waitlist, Non-attending loose set waitlist. In the body of the email please provide your full name and phone number. Being on the waitlist does NOT guarantee that you will get what you requested, as we may exhaust the additional quantities ordered. Bottom Line: Phew! This is getting exciting (and frustrating for some). It looks like we should expect this convention to be a BIG one, crowd-wise. If you plan to attend, we recommend you go ahead and reserve a hotel room SOMEWHERE nearby the Chattanooga Convention Center at ANY rate you can afford—NOW. There’s always plenty of time for you to cancel or (hopefully) get a different room at the club’s cheaper block rate—later. That is, of course, IF… Señor Savage can convince that mysterious, unnamed “third hotel” to cooperate. Good luck to us all! Go, JOE! Despite Hasbro having turned its corporate back on 12-inch GIjOE action figures and their worldwide array of fans, collectors and customizers, the “most beloved toy in the last 100 years” (see HERE) continues to make its presence known to the public in ever more unexpected ways. We’re speaking specifically now, about independent filmmaking—and stop-motion animation. Cinematographer, graphic designer and festival coordinator, Gio Toninelo (shown above, right) has just announced the opening of submissions for what will become the 5th Annual GIjOE Stop Motion Film Festival (GSMFF). The GSMFF is referred to as a “travelling” film festival, due to the fact that Toninelo will exhibit the winning entries in theaters and venues all across the country. This year’s festival premieres September 27th at the Bug Theater in Denver, Colorado and extends thereafter to LA, New York and Austin (TX). Stop-motion animation, once championed by early effects wizards Ray Harryhausen (see bio video above) and animators Rankin & Bass (of 1964’s Rudolph the Rednosed Reindeer fame), had almost become a lost and forgotten art form, but it seems to be back on the path to popularity once again. This will surprise many, because today’s CGI-dominated animators view the (much) more laborious and time-intensive stop-motion process as an unwieldy and (dare we say) “wasteful” practice from a bygone, pre-digital era. Fortunately, there are STILL some diehard (and VERY patient) individuals out there for whom stop-motion animation (and its unique results) remains a JOY to create and behold. Is Stop-Motion Animation Merely a Fad—Or Making a Comeback? Fortunately for stop-motion animation afficiandos, they don’t have to rely solely on the efforts of amateurs in order to get their “fix” of the technique. In fact, there are many influential showbiz pros out there who continue to utilize stop-motion in their projects. For example, Seth Rogen revived the technique for his standout animated TV series, Robot Chicken (see his HILAROUS GIjOE short below). Academy Award winner Nick Park too, used the process for his superb Wallace and Gromit shorts and features. Perhaps a sort of “tech-revolt” is underway, one that rages against the film and TV industry’s current overuse of CGI? If so, it appears that the nostalgic animation style is actually GROWING in popularity—with no end in sight! “Hi Mark, I’m so excited! 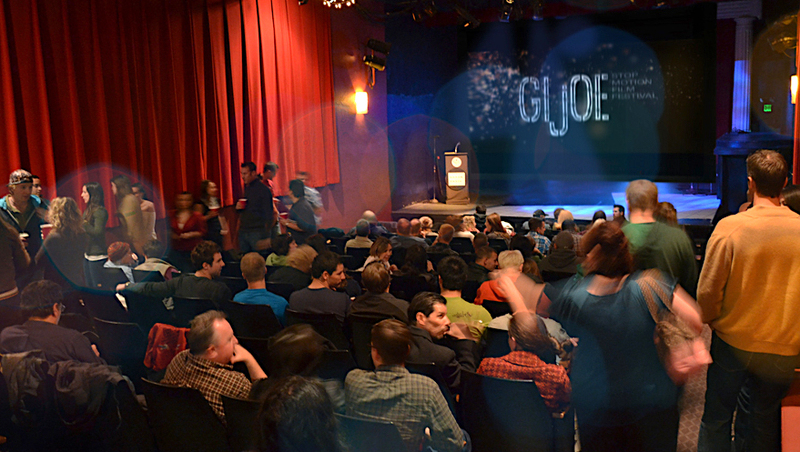 Our GIjOE film festival is back for its 5th season! I’m not surprised that you haven’t heard about our festival. We started waaaay back when the internet was a sleepy teenager. Plus, we took a needed break since 2013. Put simply, we screen films that use G.I.JOE action figures as their main characters using the ‘stop-motion’ animation technique. We always read The Joe Report and I’ve bought some stuff from Patches of Pride (PoP) in the past as well. I’ve even listed PoP as one of our sponsors! There are only TWO main rules for our Festival:1- Your film MUST be shot using stop-motion technique. Puppetry, wires and live action could also be used as long as it does not comprise 30% of the entire film. 2- Your main character MUST be an official G.I. Joe action figure, created by Hasbro, Inc. or an Action Man figure, created by Palitoy. Other licensed figures are also accepted, like “Comandos em Acao” and “Falcon” (BRAZIL) or “Commandos Heroicos” (MEXICO). Other action figures, dolls and toys can be used for supporting roles. Finally, because we are a ‘travelling’ festival, I try not to put the videos up on the web, at least not on our social media channel. We always save the BEST ones for the tour. However, some of our old trailers can still be found over on YouTube HERE. Enjoy! Fans of Films and GIjOEs— Is there anything better than watching “America’s Movable Fighting Man” up on the big screen? Here, fans gather at a past screening of Gio Toninelo’s GIjOE Stop-Motion Film Festival to watch the “Best of the Best.” (Photo: Gio Toninelo) Click to enlarge. Bottom Line: This looks like yet another EXCELLENT opportunity for GIjOE fans and customizers, as well as all aspiring amateur and/or professional filmmakers. For complete details on festival submission requirements, entry deadlines, etc., go HERE. Our sincerest thanks go out to Gio Toninelo and to everyone else connected with these exciting shows. Go, Joe! And… Go, GIO! Spray some lead, Joe! 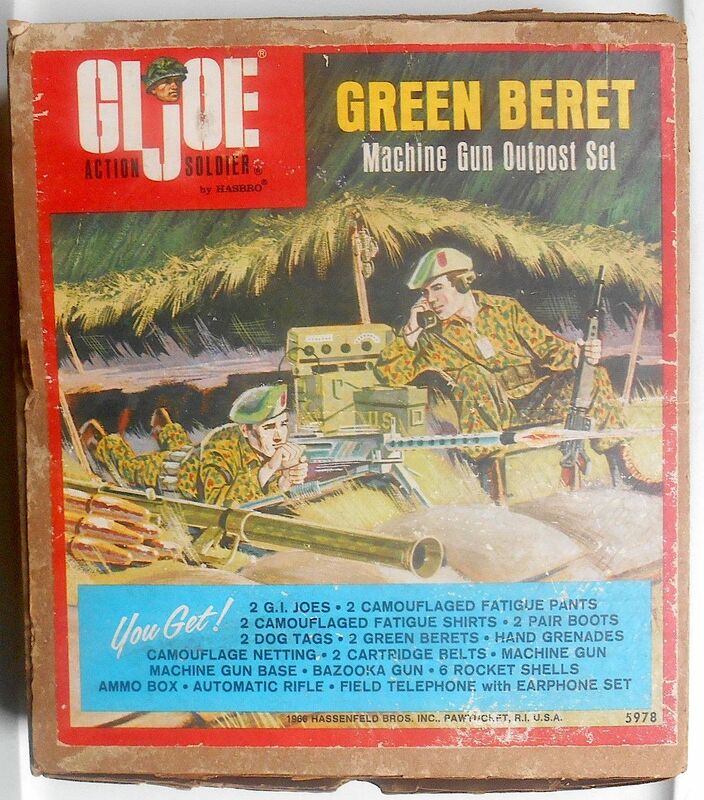 This battered (but beautiful) GIjOE “Green Beret Machine Gun Outpost Set” dates from 1965, approximately around the middle of the Vietnam War. Surviving examples are now over 53 years old and typically look like this original (found today over on ebay). Fortunately for fans and collectors of 12-inch GIjOE action figures, an all-new version of this “holy grail” of GIjOE sets will soon be produced (in very limited quantities) for attendees of the GIjOE Collector’s Club JoeCon 2018 (June 21-24) in Chattanooga, Tennessee. Will YOU be there? (Photo: ebay) Click to enlarge. Gird your loins and grab your credit cards, Joeheads! “This year, it’s back to the military for G.I. Joe. One of the favorite 12” figures of all time was the Green Beret. So, what could be better than two Green Berets in an updated ‘1960’s Sears Exclusive’ box adorned with art from Larry Selman? This year’s 12-inch Convention Set is a recreation of the ‘Sears Exclusive’Green Beret Machine Gun Outpost Set. It comes with: 2 Painted Head Figures and each figure has a Camo Shirt and Pants; Green Beret; Tall Brown Boots; Dog Tag; Belt with 2 Cartridges. In addition, the set comes with: 12 Grenades; Bazooka; 6 Bazooka Shells; Field Telephone; .30 Caliber Machine Gun and Tripod; M-16 Ri e; Ammo Box; Camouflage Netting; Plastic Foliage; Tent Poles; Tent Stakes; and 10 Sand Bags. Bottom Line: If this is indeed to be the FINAL set from the FINAL official GIjOE Collector’s Club JoeCon EVER, then those facts alone will undoubtedly make this exclusive a very hot commodity among 1:6 Joe fans and collectors. Stay tuned. We’ll keep our eyes peeled for any further JoeCon 2018 intel and/or updates and pass them all along to you here ASAP—on The Joe Report! Three Cheers for Palitoy! 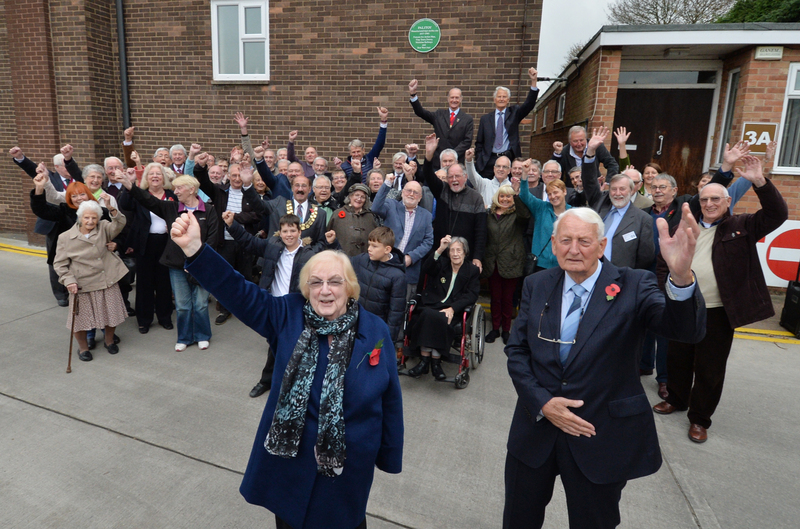 Former employees of the beloved UK toy company raise a rousing “Hip, hip, hooray!” at the site of their former business, whilst receiving the Leicestershire County Council’s honorific of “green plaque” commemorative status. (Photo: Leicestershire County Council) Click to enlarge. “Two Bobs” for Action Man! These two talented gentlemen have every reason in the world to be proud of Palitoy’s newly acquired “green plaque” status, and of their own individual accomplishments as well! From left we have Bob Brechin, former chief toy designer, and on the right, Bob Simpson, the company’s former managing director. (Photo: LCC) Click to enlarge. It’s obvious to fans living here in the U.S. (and elsewhere around the globe), that local UK community support (and thanks) for the men and women who helped bring Action Man and other great toys “to life” remains very strong. And while those lucky few in attendance at Palitoy’s recent green plaque ceremony may now largely be members of the “silver-haired set,” it’s good to know that their children and grandchildren will be able to look up at that plaque and remember all the wonderful toys created there (by their loved ones) for many generations to come. 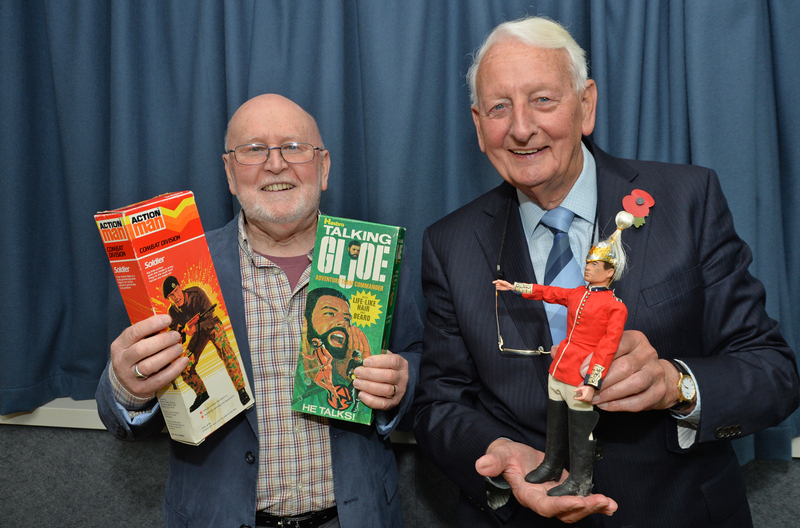 Bottom Line: Our sincerest thanks and congratulations go out to Bob Brechin for his heads-up intel on this story, and to the wonderfully generous Leicestershire County Council for their excellent photos, and to all of the other past employees of Palitoy. You’ve all done so much—to bring so much joy—to so many people. Go, Action Man! And… Hip, hip, HOORAY for Palitoy! Bottom Line: Here’s another great video from the MASTER of pop-cult videos—Mr. Rudy Pannuci! Our sincerest thanks to Rudy for taking the time to cover this year’s EXPO and for his production of yet another superb video review. Be sure to leave any comments or compliments you may have for this famous “PoPCulteer” on his blog found HERE and keep up-to-date with future Rudy videos by subscribing to his YouTube channel HERE. Go, Rudy! Go, JOE! 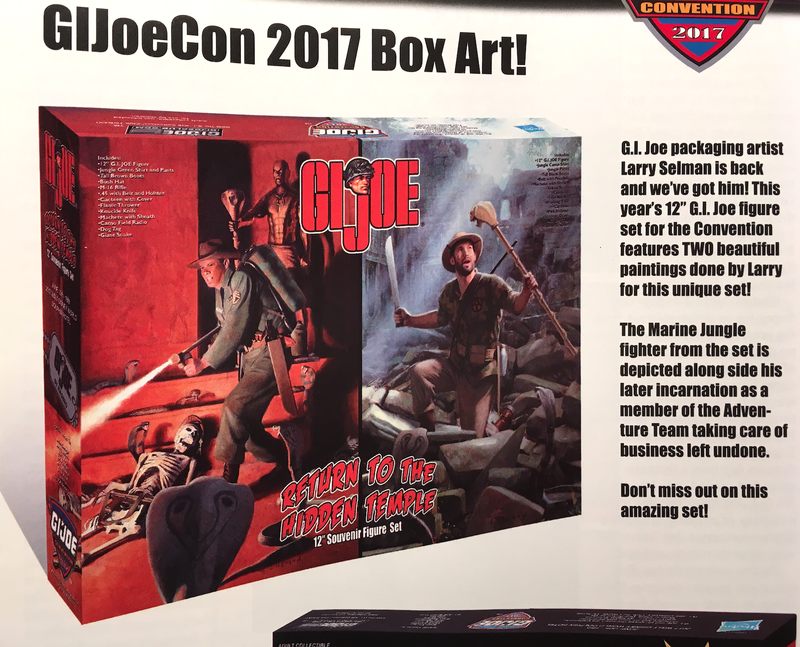 FLASH!———JoeCon 2017 12″ Convention Set Box Art Finally Revealed: Larry Selman Strikes Again! TWICE as NICE— As this photo of page 3 of the May 2017 issue of the GIjOE Collector’s Club magazine excitedly reveals, fans can expect to receive two more Larry Selman masterpieces on the box made for the JoeCon 2017 12″ convention exclusive 2-figure set. Click to enlarge. Burnin’ ’em Back to Hell— This Marine Jungle Fighter is clearly taking no prisoners tonight. But who’s that angry guy behind him? Absolutely SUPERB artwork by Larry Selman. Click to enlarge. 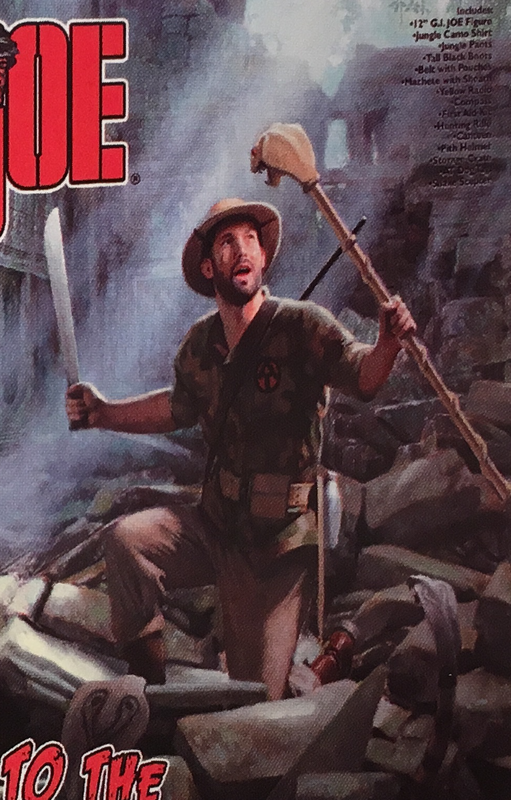 It’s his, AT LAST!— This scene of the Jungle Adventurer, clearly thrilled at his discovery of the mystical Serpent Scepter, is wonderfully brought to life by master artist, Larry Selman. WOW! Click to enlarge. Bottom Line: We couldn’t find any images of this new box elsewhere online, so we just snapped some quick pics of the club’s magazine page (p.3) that shows the artwork. And yes, once again, Classic Collection master artist, Larry Selman, has produced two exceedingly wonderful paintings for yet another exciting set. Are you planning to attend this year’s convention? If not, you can still order one of these sets online HERE, to be mailed to you after the event. Go, Joe! Go, Larry! “Stanley Weston, inventor of the G.I. Joe action figure and a pioneer of the licensing business, died May 1 in Los Angeles, his daughter, Cindy Winebaum, announced. He was 84. Weston was born in Brooklyn in 1933 and served in the Army shortly after the Korean War ended. When he returned home to New York, he found a job with the advertising agency McCann Erickson and enrolled in night courses for an MBA at New York University, where he had studied as an undergraduate. Weston soon discovered a talent for the up-and-coming licensing and merchandising industry, and he struck out on his own to found Weston Merchandising. When Mattel’s Barbie dolls were introduced in 1960, Weston realized boys were an untapped market for the doll industry after noting that many of them played with Ken dolls. He conceived of the idea of a military action figure and in 1963 sold what would become G.I. Joe to Hasbro. The runaway hit would go on to be one of the most enduring toy lines in history, spawning hit TV shows and films as well. Weston later renamed his company Leisure Concepts, which would represent clients such as Charlie’s Angels-era Farrah Fawcett, Nintendo and the World Wrestling Federation, as well as TV shows including Alf and Welcome Back, Kotter. His other notable achievements include helping create the 1980s animated phenomenon ThunderCats. In 1989, he was among the inaugural class for the Licensing Industry Hall of Fame, which includes notables Walt Disney, George Lucas and Jim Henson. 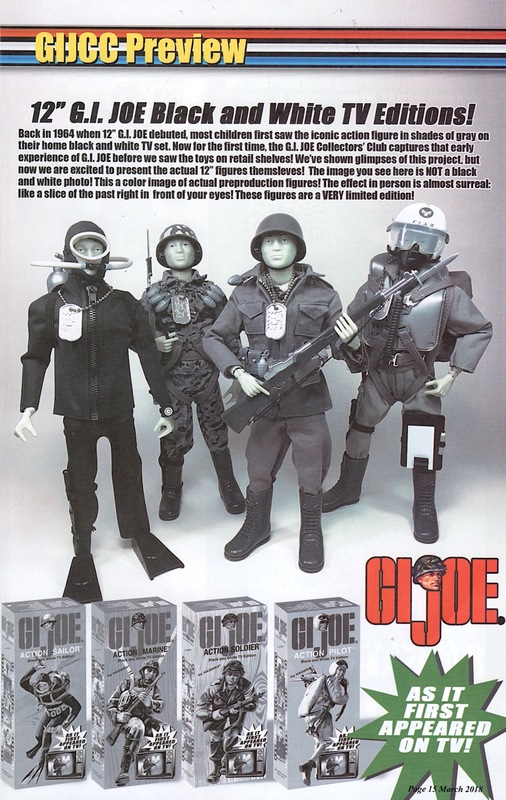 Bottom Line: Stan Weston came up with the original idea for the GIjOE toy. He quickly sold the rights to Hasbro. Don Levine (see Levine’s obituary article HERE) took the idea and made an American toy icon that will probably live forever in some form or another. At this moment, we’re not sure whether Weston’s lawsuit to recoup trademark rights to GIjOE (see that article HERE) will continue in the courts, but whenever those plans are made public, we’ll pass the information on to you ASAP. Our sincerest condolences to Stan’s family. Rest in Peace, Mr. Weston and THANKS! Did a Signed Contract Enable Hasbro to Legally Recreate Soldier’s Visage in 1:6 Scale? When PFC Phil Iverson was first told by an unknown U.S. Army sergeant (in 1962-63) to report to HQ and have his picture taken in khaki uniform and cap, he replied, “Yes, Sergeant!” PFC Iverson’s photographic mission seemed simple enough, but unbeknownst to the 21-year-old paratrooper of the 101st Airborne Division, he was (possibly) being tasked to be an artist’s model who’d provide reference for a sculptor creating the most popular toy soldier face ever—G.I. Joe. The Likeness is VERY Close— As these side-by-side closeups help confirm, it seems quite likely that freelance sculptor Phil Kraczkowski utilized the reference photos he (or a Hasbro rep) had taken of Phil Iverson. 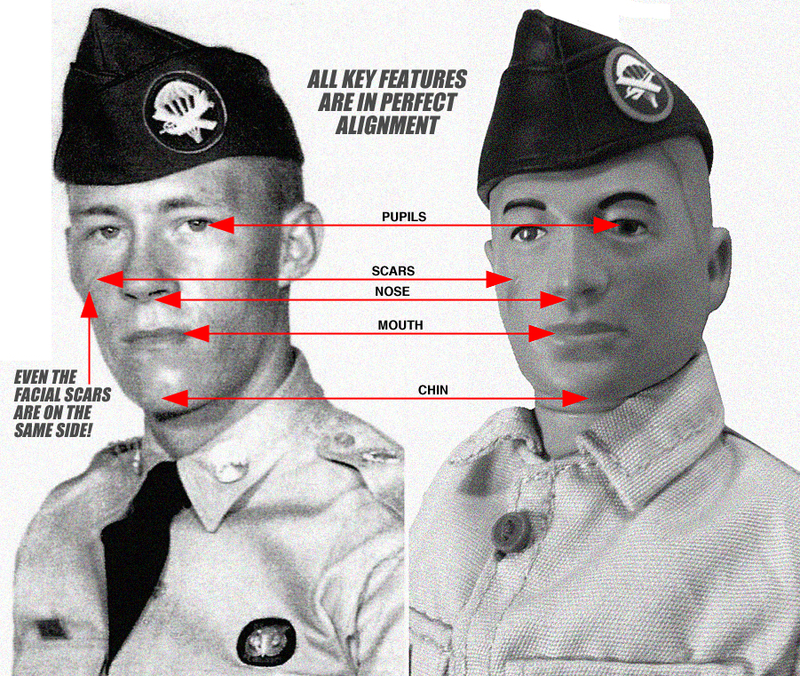 Even GIJOE’s iconic facial scar was placed on the same cheek (right-hand side). Coincidence? Perhaps. Perhaps not! (1:6 scale paratrooper cap patch courtesy Patches of Pride.) Click to enlarge. In the following exclusive interview, Phil Iverson relates exactly how he was photographed and why he believes his 21-year-old face was ultimately utilized as visual reference/guidance material by sculptor, Phil Karaczkowski, during the latter’s creation of the iconic, 1964 G.I. Joe headsculpt. “I enlisted in the service in 1961, went through basic training, MP school, and was sent to Fort Campbell, KY, to go through paratrooper jump school with the 101st Airborne. Sometime in 1962-63, a sergeant I had never seen before came into our barracks and told me to put on my uniform and double-time it over to the headquarters building to get my picture taken. “He looked me up and down for a moment and said (pointing), ‘You have to sign that release, right over there.’ He was referring to a form he’d placed on the left side of the counter. So I did as he said,. I went over to it—and I signed it. What it said, I have idea. I didn’t read it. In the Army, you’re trained to do what you’re told. As I was signing the form, I laughed and said, ‘Sure! I’ll sign. Nobody will ever want to use MY picture.’ That seemed to get his attention and he gave me sort of a double-take, you know, like he suddenly had a much greater interest in me. The Artistic Genius Behind GIjOE— Freelance sculptor, Phil Karaczkowski, was the largely unheralded creator of the iconic, world-famous 1964 GIjOE headsculpt, receiving only $600 for the assignment. 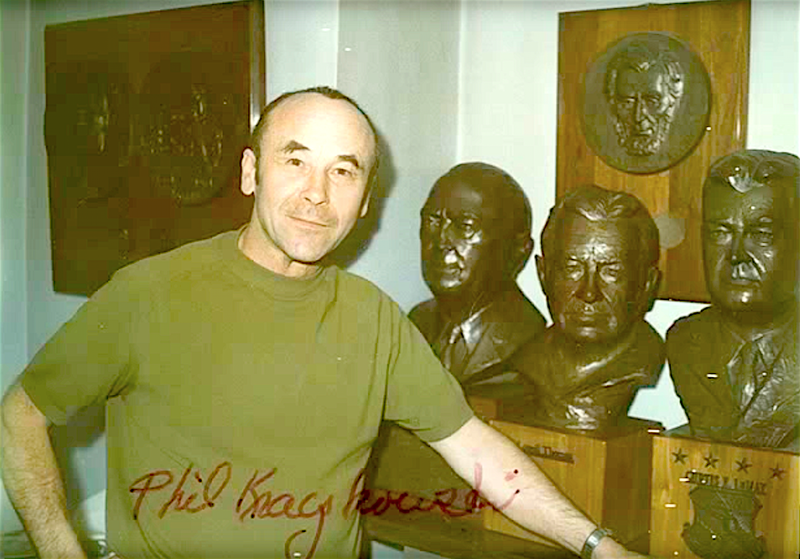 Here, he stands next to some life-sized examples of his work, bronze busts of other famous Americans. Was THIS the man who took reference photos of Phil Iverson back in 1962-63? (Screenshot taken from a video produced by DoubleACS TV, Attleboro Access Cable System, Inc.) Click to enlarge. “The next day, while I was sitting on my bunk relaxing in the barracks, another sergeant (that I’d also never seen before) came in and said, ‘Here’s a copy of one of those pictures they took of you yesterday.’ I took it, said, ‘Thanks,’ and he left. The next time I went home on leave, I gave the photo to my parents. Well, I didn’t see that photo again until 2002. My mother had just passed away and we were going through her belongings. 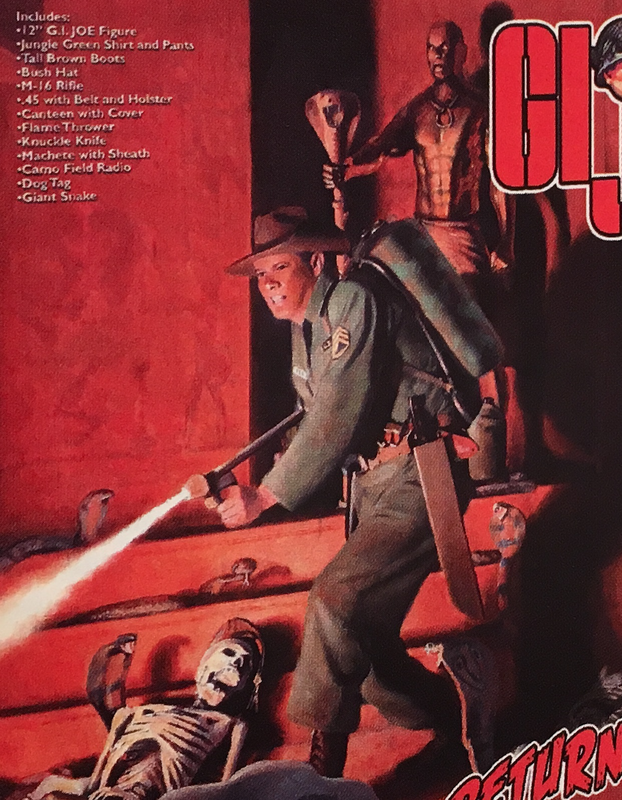 When I saw the photo again, I thought to myself, ‘Boy, that sure looks like GIjOE!’ A lot of other people I’ve shown it to also agree that it was probably used for GIjOE, but I don’t have a copy of the release I signed or any other definitive proof. TJR: Most fans believe the definitive history of GIjOE was detailed in a book authored by John Michlig entitled, GIjOE: The Complete Story of America’s Favorite Man of Action. After checking through its pages, we were unable to locate any mention of you, or of any reference photographs being taken (of anyone) for use in creating the original 1964 GIjOE headsculpt. “No. Well, that’s probably because he (Michlig) wrote that book before he knew anything about me, my story, or the pictures. But with GIjOE’s 50th Anniversary approaching, I looked Michlig up on the computer and found his website and phone number. I thought, ‘What the heck?’ and I called him. I told him that I thought my picture was used for the ’64 headsculpt of GIjOE and he seemed kinda bored, sorta like he didn’t believe me. TJR: Interesting! Has anyone else in the GIJOE pantheon agreed with your supposition? TJR: Okay, so while many people agree there’s a strong resemblance and a high likelihood that the photos taken of you were used by Hasbro or Phil Kraczkowski, there’s still no definitive written or oral proof (other than yours) to attest to that fact. No contracts. No testimonials. Nada. Did you ever consult a lawyer about this matter? TJR: Did you ever try to reach the actual sculptor of that first GIjOE head, Phil Kraczkowski? TJR: That’s a shame. Tell me, do you remember how you got your own facial scar? You May Fire When You Are Ready, Gridley!— Indeed, like the famous US Navy quote, a few years later, Phil Gridley Iverson would indeed be firing weapons for his country—but not for the Navy. Iverson enlisted in the U.S. Army instead. 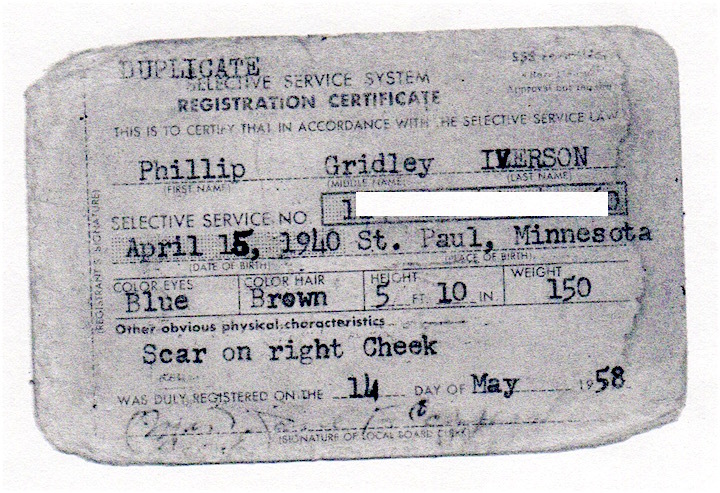 Intriguingly, his 1958 selective service registration card already mentioned the defining physical characteristic of any true GIjOE, his “scar on right cheek.” Coincidental? Yes. Fascinating? OH, YES! (Photo: Phil Iverson) Click to enlarge. TJR: Very interesting. And actually, that little card is yet another tiny bit of evidence supporting your story. Of course, we all remember Don Levine’s account regarding the addition of a scar and reverse thumbnail to the original GIjOE. It was done so that Hasbro’s new action figure would have unusual physical characteristics that would help strengthen its copyright protection. TJR: Your theory seems to be, at the LEAST, quite plausible. And it does appear that you were unwittingly immortalized in plastic. Whether or not any of it was Kraczkowski or Hasbro’s intent remains to be determined. What have you been doing since those bygone days? Bottom Line: The truth is out there…and probably rests somewhere in the middle. The idea that Kraczkowski created GIjOE’s 1964 headsculpt completely from his own imagination is certainly conceivable and believable. But taking reference photographs has been and will always remain a tried and true practice that commercial artists rely upon when facing impending project deadlines. Whether or not Karaczkowski mentions the use of reference photos in Michlig’s book, Iverson’s interpretation of the events that occurred at Fort Campbell in 1962-63 fit perfectly within GIjOE’s early timeline. And SOME civilian clearly took reference photographs of Iverson and other soldiers on that day 50+ years ago. We have the physical proof staring back at us from Phil’s photo. Nevertheless, pending any further clarification, conclusions drawn by anyone regarding the photographer’s actual intended purpose or use of his images remains (for now) mere speculation. Hopefully, someone out there will see this article and write in with further insight or intel. Our sincerest thanks and best wishes go out to Phil Iverson for his generous contributions to this article.